These are all theories on what causes the horizontal wrinkles at the waist, the vertical wrinkles below the waist, and the vertical wrinkles around the neck. Since these are all just theories, you should decided for yourself which one is most likely to be correct. Drawing by Marguerie de Jauncourt. Side laced with a wrapped belt. Horizontal wrinkles come from tight lacing at the sides. 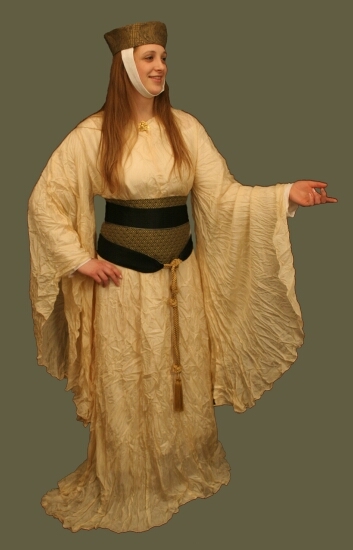 Revival Clothing (space #100, Street of Gold, Pennsic 2009). 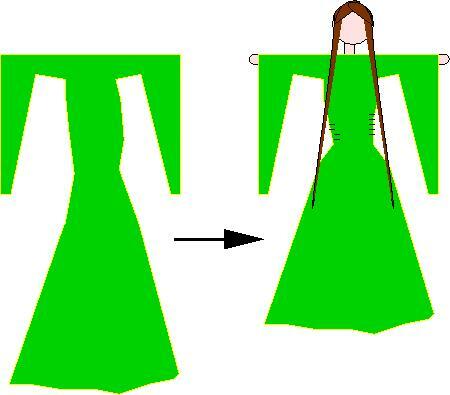 Loose with a stomacher to tighten the waist and a wrapped belt over it. Although many costumers like this look, the stomacher theory is no longer believed to be correct. However, it is a simple way to get a one-size fits all bliaut. Drawing by Aibell ingen Dairmata. Pleated skirt sewn onto seperate torso. I have tried this contruction technique and found that it completely lacked the horizontal wrinkles. This theory is now generally considered to be incorrect. Drawing by Aibell ingen Dairmata. Bias cut and side laced to let the middle stretch creating the horizontal wrinkles. 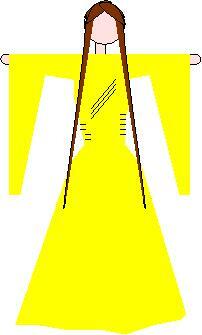 The main body of this garment is cut on the bias (diagonally on your fabric) which causes wasted fabric. Since fabric was too expensive to waste, I believe they would not have used this method. Drawing by Aibell ingen Dairmata. Waist is longer (not wider) than usual and side laced to create the horizontal wrinkles. I personally support this theory. Drawing by Aibell ingen Dairmata. Neck is cut as a slit rather than a neck hole to create the vertical wrinkles around the neck as seen in some French artwork. I personally support this theory. (Note: Some bliauts come with an obvious round or keyhole neckline and no wrinkles). Wrinkles at the wrist of the undergown caused by excessivly long undergown sleeve. Pleated gores (theory presented by a lady at Pennsic 2009). details and attribution coming soon. 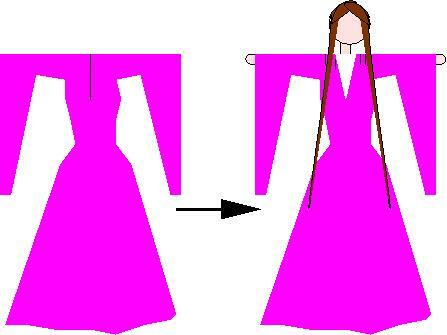 I believe that the numerous vertical wrinkles seen on the lower parts of the gowns and on the sleeves are caused by the usage of fine silk which can form knife-pleats. Some of the German gowns clearly show softer folds which can result from using soft wool. 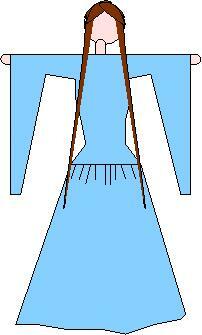 Other gowns show sparser sharp pleats which can result from using linen. Copyright © 2009 Aibell ingen Dairmata. Permission to reproduce this article is freely given as long as all attributions remain intact. I'd like a copy if you reprint this article anywhere.